Outside of plane flights and bus tickets, virtually everything you buy in this part of the world is negotiable. Lodging, trinkets and clothes at the market, tuk tuk fares, massages, and sometimes even food are all negotiated items. Although some people would rather avoid conflict or feel bad haggling over a few bucks, the reality is that vendors here factor in a premium when stating prices, assuming they will be reduced. So by not exercising your bartering skills, you’ll be losing out on a significant chunk of change! Cab fares in Bangkok: The only place we’ve taken actual cabs is in Bangkok. Everywhere else you’ll be in tuk tuks or songthaews (basically a pickup truck with a cover on the back). ALWAYS ASK THE CAB DRIVER TO USE THE METER. Cab drivers will always want to negotiate an upfront price, which will end up being way more than the meter cost. It may take two or three tries but this will definitely save you some money. 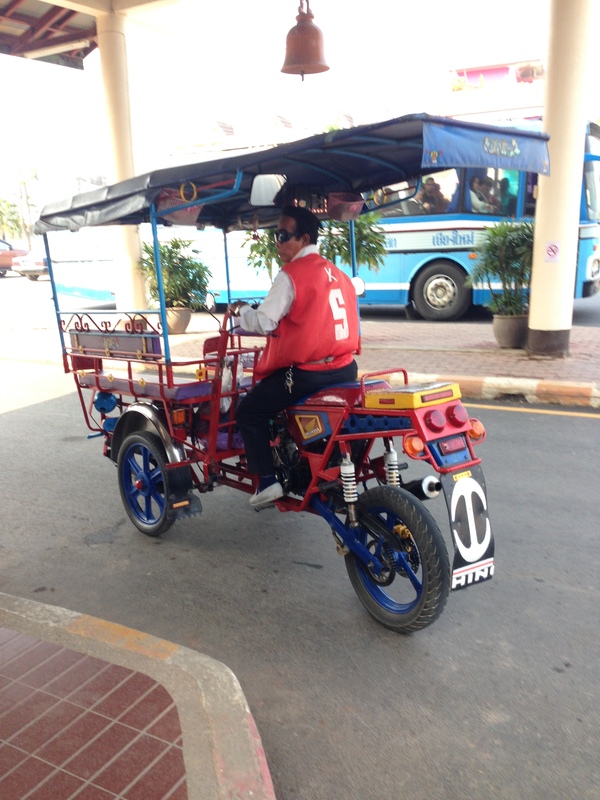 Tuk tuks: These guys are the worst! Tuk tuks are the primary form of short-distance transportation we’ve seen throughout Thailand and Laos. Most of the time the drivers will start with a ridiculously high asking price. A good rule of thumb is to expect to pay 50-60% of what is originally asked by the tuk tuk driver. If they aren’t budging, just say no thanks and wait for the next one that will inevitably drive by within 30 seconds. Another tip, cabs and songthaews are generally much cheaper than tuk tuks! Tuk tuk in Bangkok. They drive like drunken lunatics! Guesthouse/ hostel rates: Although some accommodation rates are non-negotiable, many will offer discounts if you ask. Going with a few other travelers to rent several rooms or being willing to stay several nights will increase your odds! Most places will come down 10-20%. Elephant pants in the night markets: There are huge markets (mostly night markets) throughout Southeast Asia, where people sell anything from knockoff Versace, Rolex, Polo, and other name brand items to cheap t-shirts, sunglasses, sarongs, jewelry, snake whiskey, and almost anything else you can think of. You will end up buying stuff in the markets and negotiating with the vendors is a bit of an art form and pretty hilarious. It will test your Acting 101 skills. The first step for negotiating night market items is to get a ballpark for the market price of the item you’re after. Since there are a million vendors selling the exact same products, this is usually fairly easy to accomplish. Let’s say you’re after some sweet elephant pants. The first few times you see elephant pants while strolling the market, ask the vendor how much they cost. The vendor will throw out a ridiculously high price, at which point you say “thank you” and walk away. The next part is crucial – as you walk away, the vendor will start yelling lower and lower prices at you. The lowest price they yell (usually the second or third number and taking place as you are about to pass another vendor selling elephant pants) is going to be slightly above your target range. So now you have a ballpark market price for your pants! You: “That’s okay. Kop chai [‘Thank you’ in Laos]” and walk away. You: Enjoy sporting your new, stylish elephant pants for 40% of the asking price! Go early to the markets! The people here are very superstitious, especially in Laos. They believe if their first customer buys something, they will have a good day selling to others. If you arrive early (and are thus more likely to be customer #1), you can use this to your advantage by getting better deals! Be wary of conversion rates! Most places in Laos accept Kips (the local currency), Thai Baht, or US dollars. A restaurant may ask for payment in Kips and then the street vendor just down the road will ask for payment in Baht. Many times paying in a currency other than the one asked for can cost a pretty penny. For example, the Visa cost in entering Laos was payable by either 1,700 baht, which is ~$50 USD, or payment in actual US dollars of $35 USD! Since 1 USD = 33 Baht = 8,000 Kips, and the currency asks are constantly switching around, the mental math exercises can be interesting. It’s worth downloading a currency conversion app to keep up with the hocus pocus! Also worth noting, the Laos people are very good at mental math and skimming a few % points! 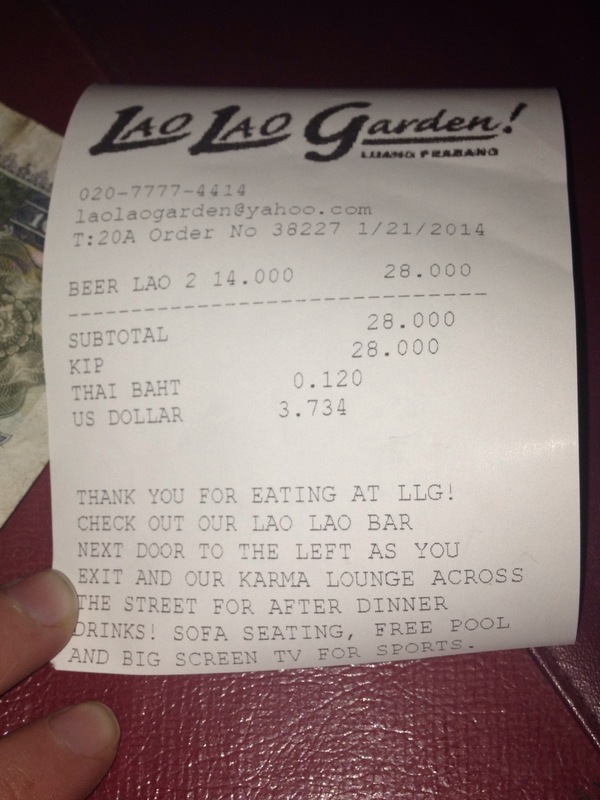 A receipt from a Luang Prabang restaurant, noting payment amounts in Lao Kips, Thai Baht, or USD. Power of numbers. This one should be pretty obvious but when negotiating items like tuk tuk fares or guesthouse rates, by having a group of 4-5 or more, you have more leverage and better ability to get a deal. When in doubt about whether something is negotiable, just ask for a discount! Worst thing that can happen is they say no. 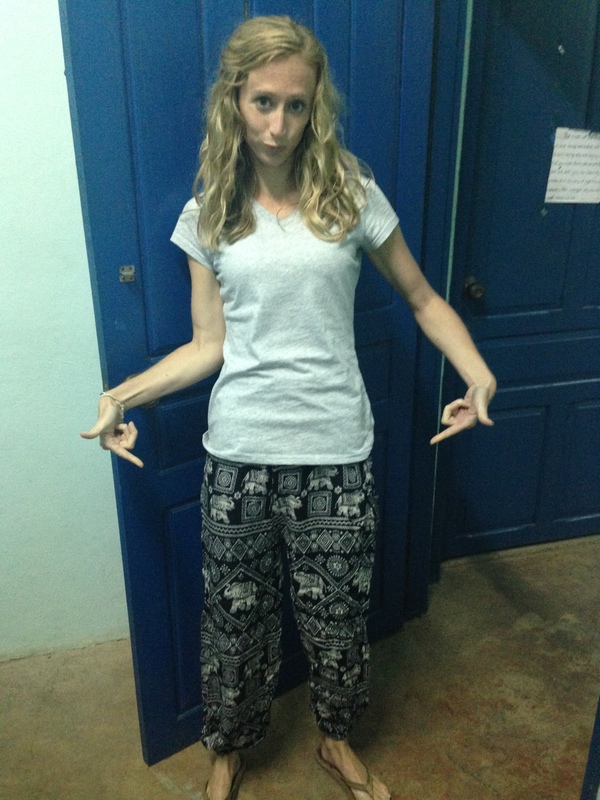 Alison and I successfully used this process to purchase some sweet elephant pants in the night market in Luang Prabang. 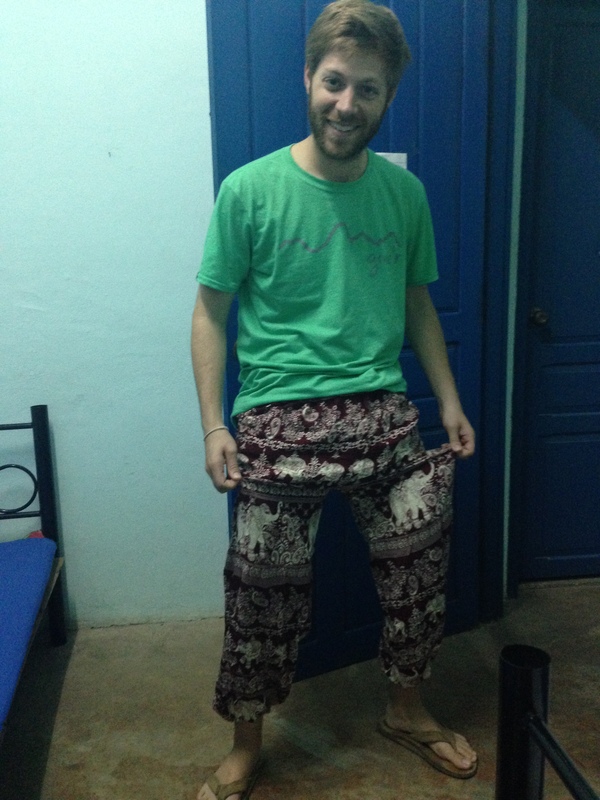 Elephant pants are comfy, baggy pants seen throughout this part of the world that more-or-less represent the backpacker’s uniform (similar to MC Hammer pants). Alison was getting cold and had seen enough people looking more comfy than she did, so she decided it was the time to pull the trigger for some MC Hammer pants. Since she’s the fashion guru, I followed suit shortly thereafter. If you come to Southeast Asia and follow the steps above, you too could find yourself wearing some of these fashion-trenders at a very reasonable price. Suzanne, you are right! The elephant pants are definitely a good look for Brian! At that price, you could get a pair for every day of the week and not have to do laundry! Just throw them away. I want some too! Mom, please stop giving Alison ideas! This is so hilariously accurate Hahahaha! I got yelled at to almost 50% off as I walked away today. I think it’s time to pay the $3.50 and get a couple comfy elephant pants! Thanks for the pointers! Lmao!